Russ Brown Motorcycle Attorneys, the leading provider of legal and breakdown assistance to motorcyclists Nationwide, enters its third year of partnership with the Sturgis Buffalo Chip, the largest music festival in motorcycling. The Sturgis Buffalo Chip announced today that Russ Brown Motorcycle Attorneys will be an official sponsor of the Sturgis Motorcycle Rally’s flagship venue through 2015. The agreement begins immediately and serves as a catalyst point for Russ Brown Attorneys to develop further levels of engagement with The Chip’s loyal and passionate audience. Russ Brown Motorcycle Attorneys identity and branding will also be incorporated into one of the Sturgis Buffalo Chip’s premier on-site properties. By the terms of the agreement, The Chip’s event center will be re-named the “Russ Brown Events Center” at the Sturgis Buffalo Chip. The property is host to many events including the famed Motorcycles as Art exhibition as well as the main traffic artery for concert goers accessing The Chip’s amphitheater from its East Gate. One highlight of the partnership is a Russ Brown Motorcycle Attorney theme night and party at the Sturgis Buffalo Chip during the Sturgis Rally. 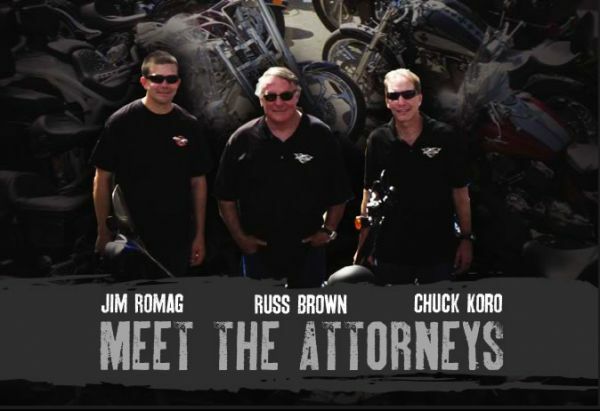 Russ Brown Attorneys, Russ Brown, Chuck Koro & Jim Romag and BAM, Free Breakdown and Legal Assistance for Motorcyclists, attend motorcycle events throughout the year, and at each of these events BAM members can sign up to win tickets to the theme night and party at The Chip during the Sturgis Motorcycle Rally. The 2012 theme night and event will be Celebrating the Women of Motorcycling which will take place on Wednesday, August 8, 2012. The Sturgis Buffalo Chip’s annual celebration of music, motorcycles, freedom and camaraderie is slated for August 3-11 and is a major destination for those attending the 2012 Sturgis Rally. For marketing information about the largest music festival in motorcycling, go to http://www.buffalochip.com or call (605) 347-9000.